1. Learn to express numbers properly. Quantities have two parts: the number and the unit. The number tells “how many.” It is important to be able to express numbers properly so that the quantities can be communicated properly. Standard notation is the straightforward expression of a number. Numbers such as 17, 101.5, and 0.00446 are expressed in standard notation. For relatively small numbers, standard notation is fine. However, for very large numbers, such as 306,000,000, or for very small numbers, such as 0.000000419, standard notation can be cumbersome because of the number of zeros needed to place nonzero numbers in the proper position. and so forth. The raised number to the right of the 10 indicating the number of factors of 10 in the original number is the exponent. (Scientific notation is sometimes called exponential notation.) The exponent’s value is equal to the number of zeros in the number expressed in standard notation. and so forth. Again, the value of the exponent is equal to the number of zeros in the denominator of the associated fraction. A negative exponent implies a decimal number less than one. Typically, the extra zero digits at the end or the beginning of a number are not included. Express these numbers in scientific notation. The number 306,000 is 3.06 times 100,000, or 3.06 times 105. In scientific notation, the number is 3.06 × 105. The number 0.00884 is 8.84 times 1/1,000, which is 8.84 times 10−3. In scientific notation, the number is 8.84 × 10−3. The number 2,760,000 is 2.76 times 1,000,000, which is the same as 2.76 times 106. In scientific notation, the number is written as 2.76 × 106. Note that we omit the zeros at the end of the original number. The number 0.000000559 is 5.59 times 1/10,000,000, which is 5.59 times 10−7. In scientific notation, the number is written as 5.59 × 10−7. Another way to determine the power of 10 in scientific notation is to count the number of places you need to move the decimal point to get a numerical value between 1 and 10. The number of places equals the power of 10. This number is positive if you move the decimal point to the right and negative if you move the decimal point to the left. Many quantities in chemistry are expressed in scientific notation. 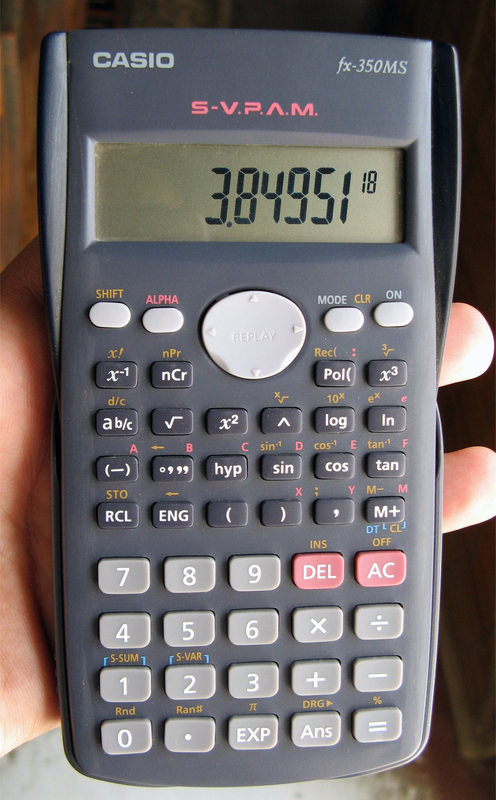 When performing calculations, you may have to enter a number in scientific notation into a calculator. Be sure you know how to correctly enter a number in scientific notation into your calculator. Different models of calculators require different actions for properly entering scientific notation. If in doubt, consult your instructor immediately. Standard notation expresses a number normally. Scientific notation expresses a number as a coefficient times a power of 10. The power of 10 is positive for numbers greater than 1 and negative for numbers between 0 and 1. This calculator shows only the coefficient and the power of 10 to represent the number in scientific notation. Thus, the number being displayed is 3.84951 × 1018, or 3,849,510,000,000,000,000. 2. Express these numbers in scientific notation. 3. Express these numbers in scientific notation. 4. Express these numbers in scientific notation. 5. Express these numbers in standard notation. 6. Express these numbers in standard notation. 7. Express these numbers in standard notation. 8. Express these numbers in standard notation. 9. These numbers are not written in proper scientific notation. Rewrite them so that they are in proper scientific notation. 10. These numbers are not written in proper scientific notation. Rewrite them so that they are in proper scientific notation. 11. These numbers are not written in proper scientific notation. Rewrite them so that they are in proper scientific notation. 12. These numbers are not written in proper scientific notation. Rewrite them so that they are in proper scientific notation. 13. Write these numbers in scientific notation by counting the number of places the decimal point is moved. 14. Write these numbers in scientific notation by counting the number of places the decimal point is moved. 15. Use your calculator to evaluate these expressions. Express the final answer in proper scientific notation. a) 456 × (7.4 × 108) = ? b) (3.02 × 105) ÷ (9.04 × 1015) = ? c) 0.0044 × 0.000833 = ? 16. Use your calculator to evaluate these expressions. Express the final answer in proper scientific notation. a) 98,000 × 23,000 = ? b) 98,000 ÷ 23,000 = ? c) (4.6 × 10−5) × (2.09 × 103) = ? 17. Use your calculator to evaluate these expressions. Express the final answer in proper scientific notation. a) 45 × 132 ÷ 882 = ? b) [(6.37 × 104) × (8.44 × 10−4)] ÷ (3.2209 × 1015) = ? 18. Use your calculator to evaluate these expressions. Express the final answer in proper scientific notation. a) (9.09 × 108) ÷ [(6.33 × 109) × (4.066 × 10−7)] = ? b) 9,345 × 34.866 ÷ 0.00665 = ? Expressing Numbers by Jessie A. Key is licensed under a Creative Commons Attribution-NonCommercial-ShareAlike 4.0 International License, except where otherwise noted.